The JBL Link 500 is the loudest, clearest and most powerful speaker in the JBL Link Series. It is also the largest speaker in the series and outputs an extended range of high-quality sound from its two 89mm mid-to-low end woofers and two 20mm tweeters. Unlike the Link 10 and 20, however, the Link 500 needs to be connected to a power source, but what it lacks in portability it makes up for in room-filling sound and audio quality. The Link 500 boasts a sleek, modern design and is made of durable fabric material and a rugged rubber housing. It looks great on a bookshelf, counter or tabletop and comes in either black or white. 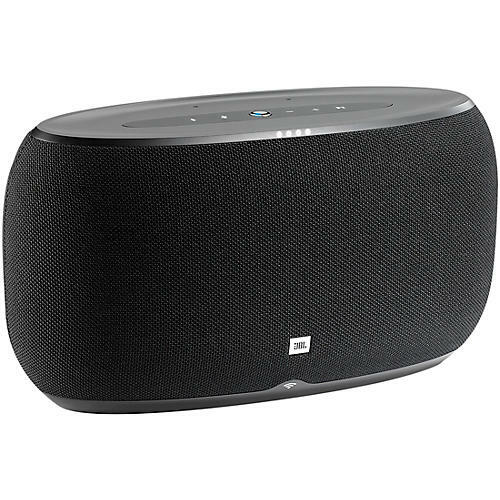 The JBL Link series is a line of voice-activated, smart speakers with Google Assistant built in. Using Google’s wake-up phrase “OK Google” or by pressing the Google Assistant button, you’ll be able to control your music, your home’s smart applications, prompt searches, manage your tasks, schedule an appointment and even get the latest weather, news, or traffic updates. The Link’s far-field voice recognition allows for easy hands-free operation when the speaker is across the room or even out of sight. The Link also has Chromecast built in allowing you to pair the speaker with other Link speakers to create a surround or multi-room playback system that is controllable with the Google Home app. Chromecast will also allow you to control services from a connected Smart TV so you can watch your favorite shows or movies with a voice command.